Years ago I was introduced to kombucha tea by a friend. It's an acquired taste that has grown on me. What is kombucha tea? Simply put, kombucha tea is a beverage produced by fermenting sweet tea with a culture of yeast and bacteria. Sounds yummy, right?! Although it's not proven kombucha is said to have tons of health benefits. Whole Foods Market recently started carrying Health-Ade Kombucha Teas ($4.99/16 oz.) and sent me a few flavors to test out. Health-Ade Kombucha offers a bubbly and delicious probiotic tea for anyone seeking ways to boost their energy and improve their health. Why choose this brand? It’s all good: organic whole ingredients, 100% raw and vegan, with great flavor. Since I'm pregnant I decided to only have a little taster. Nick enjoyed the rest. So it's really a combo of "our" thoughts. I personally don't drink Kombucha daily or even weekly. Typically I'll buy it when I'm feeling a little off my game, if my stomach is upset, or when I want something other than water, tea, juice etc. Health-Ade offers eight flavors. Of the three we tried Nick and I both agreed the Pink Lady Apple was our favorite. It was the perfect combo of sweet and bitter. I felt the plum was a bit too much and the original just didn't move me, but then I've never been a big fan of straight kombucha tea. 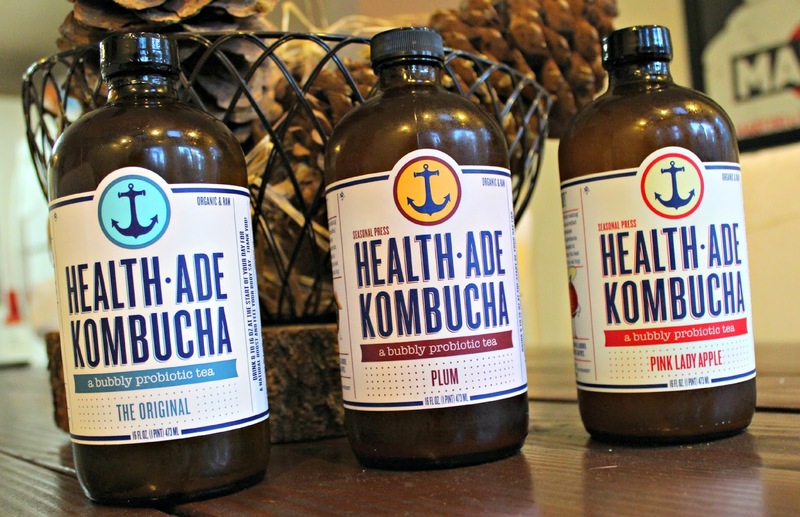 Five reasons I'll purchase Health-Ade Kombucha Teas in the future. I've tried a number of brands of kombucha tea over the years and Health-Ade is at the top of the list. Are you a fan of kombucha tea? Do you have a favorite flavor or brand?